Parallel Gripper | High Capacity Pneumatic | GRR | PHD, Inc.
Series GRR Guardian® High Capacity Pneumatic Parallel Grippers provide high grip force, long jaw travels, and high jaw loads. This heavy duty end effector’s rugged design and jaw construction can withstand high impact and shock loads. Series GRR Grippers are designed for gripping large objects in demanding industry applications including small engine block manufacturing, automotive wheel rim manufacturing, foundry applications, and more. 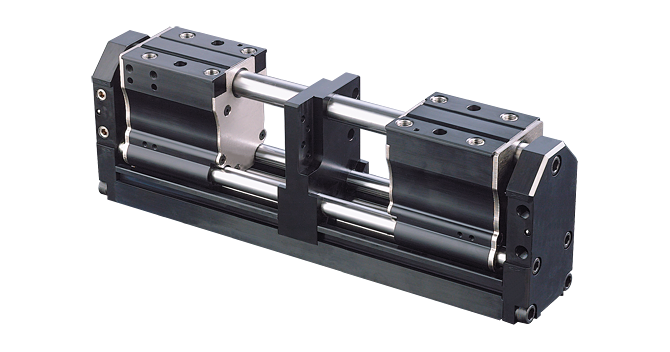 Narrow width, long jaw travels, high grip force, large moment capacity, rugged design, true parallel jaw motion, long unit life.